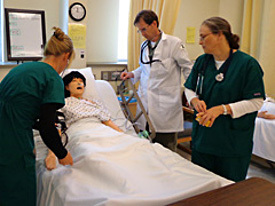 Northwestern Michigan College offers first-time students the opportunity to earn a Practical Nursing (PN) certification or an Associate Degree in Nursing (ADN). Students with a Licensed Practical Nurse (LPN) certification can earn their ADN via the LPN to ADN completion option. After successfully completing the Practical Nursing program, students become eligible to take the National Council Licensure Exam for Practical Nurses (NCLEX-PN). Students become eligible to take the National Council Licensure Exam for Registered Nurses (NCLEX-RN) after successfully completing the Associate Degree program. NMC also offers students in the Associate Degree program the option to take an elective at the end of their second semester. This option gives the ADN students the opportunity to complete the PN program, take the NCLEX-PN exam, and work as a Licensed Practical Nurse (LPN) while completing the remainder of the ADN program. NMC nursing programs are approved by the Michigan Board of Nursing and are accredited by the Accreditation Commission for Education in Nursing (3343 Peachtree Road NE, Suite 850, Atlanta, GA 30326, (404) 975-5000). Any pre-nursing student planning to transfer a pharmacology class to NMC, please contact the Nursing Department prior to registering for any non-NMC pharmacology class.